There are a lot of ways one can imagine on how to integrate palliative care into the intensive care unit (ICU). Some of these ideas don't work so well, like in a recent JAMA article that we discussed in a GeriPal post titled "Fast food-style palliative care consults found inneffective, may cause PTSD." In todays GeriPal podcast, we talk with ICU doctor and researcher, Bill Ehlenback, about some ways that may work, including a discussion of his recent study looking at a proactive palliative care rounding intervention. Along the way, Alex takes us on trivia journey celebrating the work of Leonard Cohen. Braus, N., Campbell, T.C., Kwekkeboom, K.L. et al. Intensive Care Med (2016) 42: 54. Alex: And this is Alex Smith. Eric: And Alex, we have a special guest on the line, don't we? Alex: We do. We have a special guest. This is ... Wait, hold on. I was just thinking like is it, "ee-len-bach", "ellen-bach"? Eric: Oh, yeah. I think, good question. So, the phonetic, I'd say "think of beer". So, "ale-in-bach". Ehlenback. Alex: We have Bill Ehlenback, who's an assistant professor of medicine at the University of Wisconsin. He's a pulmonary and ICU critical care physician. He's interested in conducting research and outcomes after critical illness in older adults. Also interested in palliative care. I had the joy of getting to know Bill a little bit better at the recent Beeson Geriatrics Research Scholar meeting outside of Chicago and we had a great night not just learning about research, but also singing around a fire-pit until about one thirty in the morning. Eric: So Bill I'm going to turn it over to you. We usually start off with a song. Do you have any requests for Alex? Bill: You know, I think it would be timely if we could hear perhaps something from Leonard Cohen. Eric: And in no way did we set Bill up to give us that answer. Alex: No, we wouldn't do that. Eric: So, Alex. A little Leonard Cohen. Alex Plays "Hallelujah" by Leonard Cohen.Well I heard there was a secret cord that David played and it pleased the Lord, but you don't really care for music do you? Well it goes like this, the fourth of fifth, the minor fall, the major lift. The baffled King composing Hallelujah. Hallelujah. Hallelujah. Hallelujah. Hallelujah. Well, Leonard Cohen. It's sad. He died last week. What an incredible songwriter. Couple interesting things I learned about Leonard Cohen recently through reading quite a bit online about him. Did you know that he died of a fall? Bill: The geriatric syndrome right there. Alex: He was 82 years old and he died of a fall, and died in the middle of the night. Another thing I learned recently is ... I listened to a podcast by Malcolm Gladwell called, his podcast called, "Revisionist History," and he had a segment called Hallelujah. And in that segment, he talked about how this song, "Hallelujah" by Leonard Cohen didn't just come out on paper as a great song, like many of, say, Bob Dylan's songs did. Leonard Cohen took five years to write this song, and he just kept reworking and reworking it. Even after he finished it and started performing it, he didn't quite get it right. It took years for it to get right. Actually was picked up and reworked by a guy from the Velvet Underground, and released on an obscure album that somebody in New York City happened to buy, and the house sitter for that person happened to play this album while he was house sitting. Do you know who that was? That was Jeff Buckley. Bill: I was going to guess Jeff Buckley, that's how I first heard the song. Alex: Yes, and so Jeff Buckley later played the song in a bar, and a Columbia Music executive heard him play and decided to sign him. Jeff Buckley played the song on his album "Grace." Amazing interpretation of the song. Alex: And yet it still didn't catch fire. It wasn't until Jeff Buckley died around 1997 that people really started listening to his music, and they realized, this is an amazing song. And since then, it's been reinterpreted about 100 times, but it's this history of how some great works don't come out fully formed the first time. And some people, like Leonard Cohen, had to rework, rework, rework, as opposed to Bob Dylan, recent Nobel Laureate, who just has a vision and a dream, puts it down on paper and it's perfect the first time. Eric: That's almost a good transition into our topic today. Because having done palliative care now for a little over a decade and trying to figure out how to integrate palliative care into the ICU, it feels like we've gone through a lot of revisions. Alex: How are you going to work that in? Bill: Nice. That's quite a segway. Alex: It's a good segway. I like that. Eric: I just thought of that. There's been several recent public about integrative palliative care in the ICU. Alex: Yeah, there was that study that we wrote about on GeriPal, "In N Out Palliative Care". Eric: Yeah, recent JAMA study on critically ill ICU patients, where the protocol that they used, which included a palliative care physician doing informational sessions, it had no improvement in their primary outcomes. And there was a suggestion of increased PTSD symptoms. Alex: I think so. There is a lot of controversy about that article. I'm sure you've read that one, Bill, and have some thoughts. But before we get to that, maybe we should talk about this article that you published. This is in Intensive Care Medicine and we'll put the link below after the post. The title is, "Perspective Study of Proactive Palliative Care Rounding Intervention in a Medical ICU". Bill do you want to tell us a little about what you did? Bill: We sort of came at this project thinking about what kind of change could we make to practice that really is about the delivery about primary palliative care. So what kind of intervention could we think about that might get critical care doctors themselves to think about the palliative care needs of their patience, and perhaps think about them a little bit earlier. We also thought about making, you know, creating an intervention that would be seen as non-threatening, if that makes sense? So, I think there is a occasionally and I think historically much more so, the potential for culture clash that you have groups of docs in the ICU and they see palliative care names, or physicians, or you know, other conditions as somehow being outside of the ICU. So our intervention that we studied in a before and after implementation design, was essentially to prospectively identify patients at high risk for death, or imperative recovery, or high risk of having one that palliative care needs. And for those patients, during our intervention time frame, we had a very experienced palliative care nurse, simply interfaced with the critical care medicine team during their large, often slow disciplinary rounds in the morning. Eric: And there's a lot of teaching going on. There's a lot of discussion. And sometimes for consultants it may not be the most efficient use of their resources just to hang out with the team for three to four hours. Was that an issue? Bill: Absolutely. I think that is a very real challenge. You know, for this study, there really was collaboration, there really was partnership among a lot of different people and groups of people, and in particular we have the support of, you know, a very robust palliative care service who was ... And the individual nurse who really played the role of the intervention in the study, they have the ability and the willingness to essentially, during the six month intervention time frame, she spent the vast majority of her time in our main 24 bed ICU. Eric: So what did the palliative care nurse actually do during this intervention? Bill: Great question. So we review charts every morning. Myself, and some research staff. And so we would essentially contact her every morning during the intervention and say, "these patients in these beds met this inclusion criteria". So on day one, after we identified those patients, she would interface with the critical care team on rounds, and she would tell them, "I'm here because this patient met this trigger criteria." On the first day, that was essentially it. So she would listen to rounds. She often gets some additional information from the bedside critical care nurse. However, she did not interact with patients or families. So really it was an intervention aimed at increasing her communication with the critical care team. So, day one it was essentially, "I'm rounding with you on this patient because of this reason." And on subsequent days, she might make a suggestion, like the nurse told her that, “the family has some concerns about this issue.” She would make observations on day four, five, or six, “[This patient] has been here for five days, have you guys thought about a family meeting?” She did not as a matter of course participate in family meetings. And I think one of the differences between this intervention and some prior interventions that have been published is that this did not have trigger criteria leading to a full palliative care consult, and in fact the number of palliative care consults requested, or the proportion requested, did not differ at all from the pre to the intervention time period. But just that pretty simply intervention of the palliative care nurse on rounds, occasionally voicing some of these, you know, significant issues, particularly around family meetings, did prompt the team to hold family meetings much more frequently. Number of family meetings increased 60%. And for those patients where a documented family meeting happened, it happened the time from ICU admission to the meeting was 40% shorter during the intervention time period. Alex: Wow. That's interesting. So just having the palliative care specialist there rounding with the team, not fishing for consults as we sometimes do, led to more family meetings, and family meetings that occurred earlier in the course of the critical care stay. And did you look at outcomes for these patients in the ICU? Bill: I mean, we did see a significant reduction in total hospital length of stay. And when we looked at just the patients who ending up dying in the hospital, so the patients who did not survive to discharge, there was a significant reduction in hospital and ICU length of stay. You know, which we interpreted as saying that this intervention did seem to move decision making up front in a sense. We did not see differences in mortality rate. I don't think this changed the decisions that were being made. I do think that it likely changed the time frame around decision making, or around defining or perhaps changing the goals of care. Eric: It sounded like you guys created a practical intervention that could potentially be sustained. And improvements and some significant outcomes including length of stay in the ICU. Are you guys still doing it after the 6 months? Bill: Yeah, see that's a great question. This is a pretty substantial time commitment of a professional on the palliative care team, really that means it’s a pretty substantial resource commitment. So one thing that we explored or thought about was, are there other ways of moving family meetings a little bit earlier in the stay? And so one change that we made right off the bat, was we actually developed a process, a protocol, by which our health unit clerks start the process of scheduling meetings essentially automatically. So instead of waiting for some member of the critical care team to start the process with the family, and the nurse, and the social work, and the unit clerk of trying to find a time and coordinate a meeting, we sort of turned that on its head a little bit. So the expectation is that, unless somebody is expected to have a really short stay, our goal as a unit is to have high quality sit down interdisciplinary family meetings by the third day. Eric: Interesting. So you changed the norm? Eric: So the expectation is a family meeting. Yeah. Bill: The other thing we did, which is actually kind of exciting. Because of what we had found in this study, and because of what Randy Curtis and his group out of Seattle showed with the randomized trial of a communication facilitator ... We, and by we I mean myself and Toby Campbell, the head of our palliative care group, and Anna Moore, who's the manager of nursing in our intensive care unit, made a case to our hospital administration to say, "here is a novel, evidence based intervention that can have some really palpable benefits in patient care by reducing non-beneficial or loss-beneficial care." And so we actually just hired, and obviously it was relatively long process of getting approval and listing positions, but we just hired two full-time nurse communication coordinators for the four-bed ICU. So these are experienced critical care nurses who are currently undergoing pretty prolonged, and I think relatively intensive, communications skills training, some palliative care training coordinated by, again, this multi-disciplinary group. Bill: Some of the details of implantation I think are going to evolve. But the idea is that ... And I'll also mention we did measure, in our study, we did measure family outcomes, including depressive and PTSD symptoms as well as family rating of the quality of death and dying for patients who died. And we did not see any significant differences. We saw a signal of reduced PTSD symptoms from family, but it was not statistically significant. And one of the way we interpreted that, is that our intervention I think did move, communication did move, family meetings up, but I don't think it necessarily had any impact on the meetings themselves. And I think we know from the literature, and I think anecdotally in practice, there is just a lot of variability of how family meetings are carried out in the intensive care unit. And I think as the evidence basis evolved, I think we can say that there is variability in quality. You know, I think we can objectively say that these meetings should include discussions of prognoses beyond mere short term survival. But these meetings should have discussion of patients’ values, and preferences in the context in which they live their lives. And so, essentially these nurse communicators are going not only play a role in planning, timing and setting up family meetings, but they're actually going to have a role within the family meetings. I think the vast majority of our meetings in the ICU are still going to be led by members of the critical care team, whether the attending, the fellow, the nurse practitioner. Bill: And the family is getting the blank look on their face. Eric: I've never seen that happen before. Bill: No, right? It's totally ... It's hard to believe, right, that it could ever happen? But, our vision is that April or Andrew, these are the individuals who have taken these new roles, will be empowered to say, "you know, maybe we can step back and see what the family's understanding of everything is. Or perhaps this might be a good time to hear about our patient as a person, or what she might tell us about what's going on." Eric: I got a controversial question for you. A lot of what you're doing sounds like it's improving primary palliative care skills of ICU, integrating primary palliative care ... Is there a role, still, for interdisciplinary palliative care consultations in the ICU? Bill: Yeah, and I would say absolutely. And I also want to acknowledge, you said it's a controversial question. I think even among the critical care docs who do research in this area, or who are very interested in this area, I do think there's still a lot of diversity of opinion about how much palliative care in the ICU should be primary palliative care delivered by the ICU team and how much of it really should be delivered by a palliative care specialist. Personally, I think ... There's a couple ways that I think about it. One, I think if all high risk patients required a palliative care consult, if I think about it on a population level, national level, even just thinking about every large hospital, every academic hospital, I do think there's sort of practical limitations to what could be achieved certainly today, but perhaps even in the future, I don't know. But I think there is a practical consideration. Personally, I think that there is absolutely a role ... In my own practice, I try to deliver high quality primary palliative care, but there are absolutely situations where I feel like I need help. I need an expert, I need someone who does this all the time. And so, it's still a huge service to be practicing in a hospital, practicing in an ICU, where you have that support of expert palliative care providers. And I don't know what the ideal split would be. Is it 80% primary palliative care by intensivists? Is it 20% consultant involvement? I don't know how that breaks down in any given ICU, but I do think that's still an absolutely needed service. Alex: If you had to give one suggestion to our listeners based on this research that you've done, so they can change their practice in the ICU, I guess, what would that be? Bill: Yeah, I don't think there ... I think the state of the evidence are it exists right now, thinking about the article that we published, and really all the literature that I'm aware of, I don't know that we can say that there is one model, that is the best model, that should implemented in every ICU. What I would say is, and I think the work that we've done, I think that it demonstrates that this is one way to improve the way we deliver palliative care in the ICU. I think in critical medicine, we are at the point where the culture has changed. I think we all agree, or we just about all agree, about the incredible critical importance of the palliative care needs of our patients and their families. But even as we have these professional societies, and the guidelines, and the very strongly worded, "you should meet these needs," I think in reality we're not doing a great job in many or most of our ICU's. So the take home I would recommend is to think about your own ICU, think about your own unit, and really evaluate how well you are doing this. And one easy metric, I think, kind of as a first step, is really to say, "How are we doing with family meetings? How early are they happening?" And I think I would advocate also trying to confront the question of, "What is communication? What does a family meeting mean?" Because I think there is still some disagreement about the role of standing at the bedside at rounds, and giving the family an update, and I do think there's some intensivists who sort of think as that being analogous to a family meeting, where I think that it’s actually very very different. So I think I would say there's not one solution for every ICU. But I think we are at the point where this is an important realm for quality improvement, and thinking about, are we having family meetings, are we holding them early? And if not, drawing from the literature to look at I think the variety of interventions that may have value, may be effective. Eric: Bill, thanks for that excellent discussion. Alex, do you have any other fun facts for us? Alex: So one other fun fact about Leonard Cohen and this song Hallelujah. A couple months ago I was reading an article in New York Times about how Hallelujah was overplayed. And that if you look at any major T. V. show there's some episode that incorporates the song, Hallelujah. And they actually linked to all these YouTube clips from these different series, you know, The West Wing, et cetera. 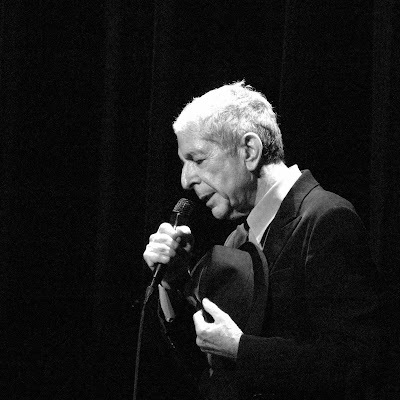 Leonard Cohen asked for moratorium on Hallelujah. Alex: Actually toward the end of his life. Eric: So that's why I never heard of it on Game of Thrones? Alex: Yeah, right. It'll be in the next season. But despite that, we'll play it one more time in honor of Leonard Cohen. One more verse. Alex Plays "Hallelujah" by Leonard Cohen. But baby I've been here before. I've seen this room and I've walked this floor. You know I used to live alone before I knew you. And I've seen your flag on the marble arch, but love is not a victory march. It’s a cold and broken Hallelujah. Hallelujah. Hallelujah. Hallelujah. Hallelujah.